First introduced in 2016, Android Instant Apps has expanded across the Google Play Store to include more popular games aside from things like NYTimes - Crossword. With it, which is now being referred to as Google Play Instant, you can play games such as Clash Royale or Words with Friends 2 without having to download them first, giving you a feel for the game without any commitment. If that "Try Now" option isn't listed next to the "Install" button on the app's Play Store page, the first thing you'll want to ask yourself is if the game even has an Instant App version, which could either be a trial of a certain level in the game or a mini-game experience that gives you the feel of the entire game. Right now, only a limited number of developers have created Instant App versions for their games, and they can be played either in the Google Play Store, the Google Play Games app, or wherever the game links are shared, accordingly to Google. As of March 20, 2018, the only games available are listed below, but you can check Google's Instant Gameplay collection to see if new games have been added. As for non-games, you have more options to try them out since more regular apps support Instant Apps since it's been out for years now. Check out Google's Apps to Try Now collection to see just some of the ones available, otherwise, just look for that "Try Now" button on an app's Play Store page. Android Instant Apps are supported on Android devices running Android 6.0 and higher. If your smartphone is updated to at least Marshmallow, you'll have access to the feature. It's likely your device is running 6.0 or higher if you bought it new within the past two years, however, follow the guide below to confirm what version of Android you have. 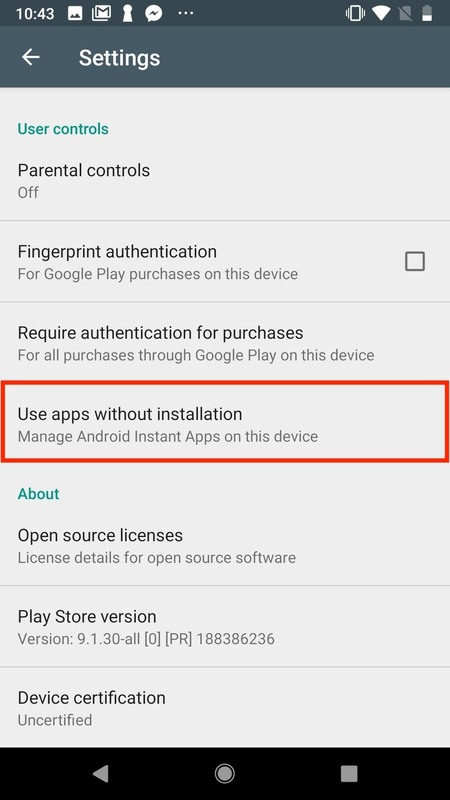 Next, you're going to want to make sure that Android Instant Apps are enabled. 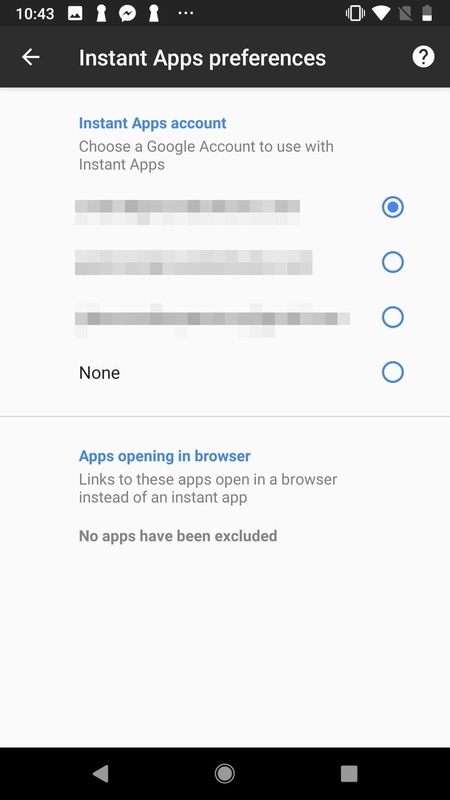 When you first try to play an Instant App from the Play Store, you will be prompted to opt in or say nope. If you said "No Thanks," then you won't get the prompt again, and the "Try Now" link will just open information in your web browser or the "Try Now" link will completely disappear. 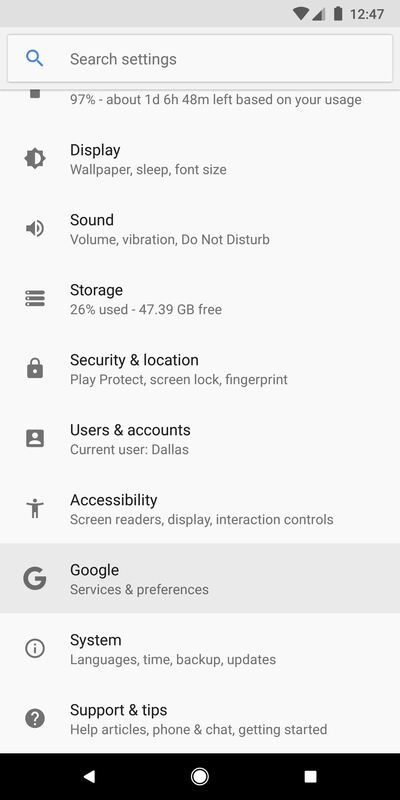 Open up your Settings, then tap "Google." 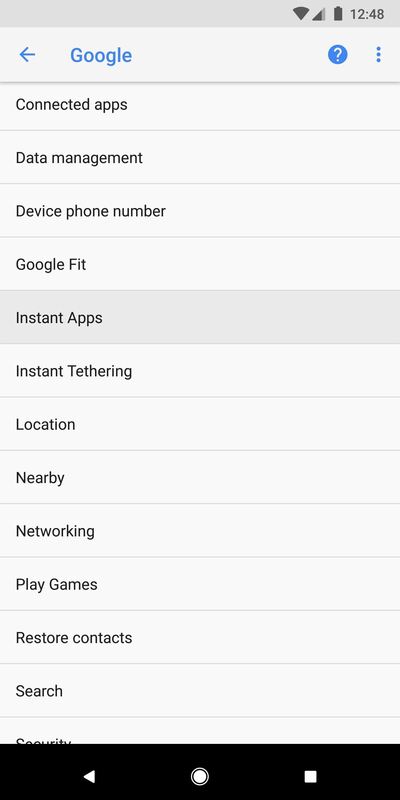 Tap "Instant Apps" from the list of Services options, then select the Google account you'd like to use for Instant Apps. Finally, tap "Yes, I'm In" to authorize Instant Apps. 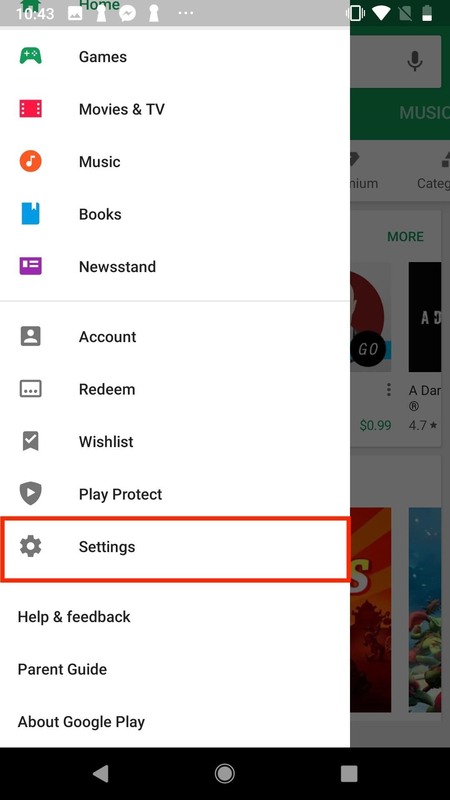 You can also check these settings in the Play Store. Tap the hamburger menu in the top-right corner, then tap "Settings." 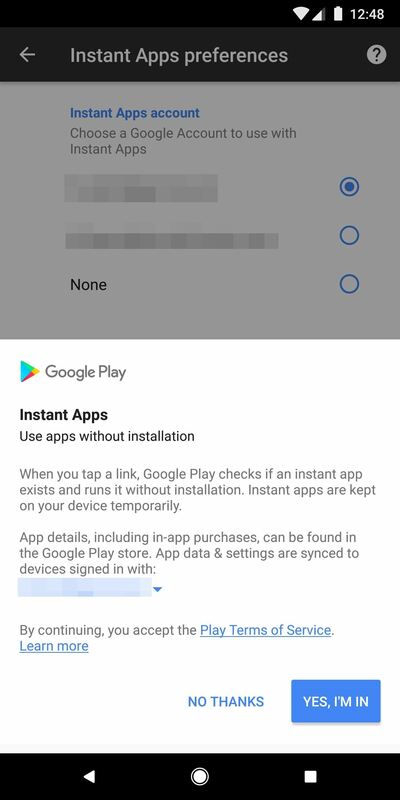 On the following page, tap "Use apps without installation," then make sure one of your Google accounts has Android Instant Apps enabled. With these options selected, you should now have access to Instant Apps. Keep in mind, most apps don't support this feature yet, so if your favorite apps don't appear, it doesn't mean the feature isn't working for you.